Dzogchen Ponlop Rinpoche (རྫོགས་ཆེན་དཔོན་སློབ་, Wyl. rdzogs chen dpon slob) Karma Sungrap Ngedön Tenpa Gyaltsen (b.1965) — the seventh incarnation of Dzogchen Ponlop Rinpoche was born at Rumtek Monastery in Sikkim, in 1965, and was immediately recognised by His Holiness the Sixteenth Gyalwa Karmapa. He has studied at Columbia University in New York and is fluent in English. Rinpoche has been travelling and teaching in the West since 1980, when he toured with His Holiness Karmapa. 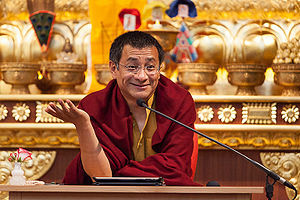 Dzogchen Ponlop Rinpoche is known for the lucidity of his teachings, and his sharp intellect and humour. Ponlop Rinpoche formally established Nalandabodhi as his primary teaching organization and sangha community in 1997, and Nalandabodhi soon developed into an international network of Buddhist study and practice centers. 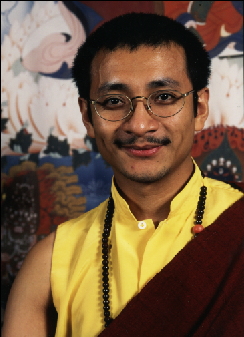 In 2001 Ponlop Rinpoche made Seattle the home base for his growing dharma activities, including Nalandabodhi, Nitartha International, and Nitartha Institute for Higher Buddhist Studies. Teachings on 'The Heart of Mahamudra and Dzogchen'. These teachings are published in Wild Awakening. Rigpa London, 5-13 November 1994. This page was last edited on 13 June 2018, at 08:30.